Little Alfie Evans, who is fighting a rare neurological condition. is finally getting food. Alder Hey Children’s Hospital waited 28 hours before feeding the 23-month old boy. "This evening the High Court again ruled that it is in Alfie’s best interests to continue with the end of life care plan developed by the clinical team who have cared for him throughout. "Our top priority therefore remains in ensuring Alfie receives the care he deserves to ensure his comfort, dignity and privacy are maintained throughout. "This includes working closely with Kate and Tom as they spend this precious time together with him. The judge said: "The sad truth is that it is not the brain stem and the white matter enabling Alfie just about to sustain respiration. A brain cannot regenerate itself, as I have been told." The Evans family are in court again today fighting to overturn a jduge’s decision preventing Alfie from going to Italy for proper care. Alfie Evans survived for 36 hours after a children’s hospital removed his life support without his parents’ consent. Justice Hayden said flying Alfie to Italy could harm his health because, as court testimony , the flight could trigger possible “continuous seizures due to stimulations” of the flight. Evans explained that Alfie is not in any pain and that Alfie is not having any seizures at this time. Italy has granted Alfie Italian citizenship which would allow him to leave the country. Attorneys for his parents say they want Italian doctors to be able to come to Britain to evaluate and treat Alfie. 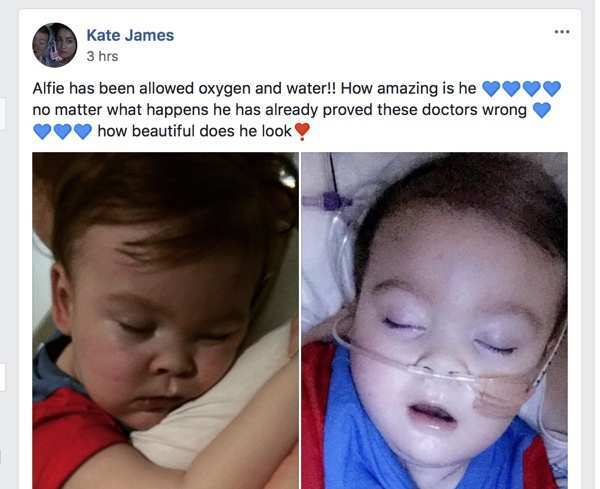 A spokeswoman for the Christian Legal Centre, said medics at Alder Hey Children’s Hospital in Liverpool had stopped providing “ventilation support” to Alfie shortly after 9pm on Monday. However, Alfie continued to breathe independently. She said: “Alfie has survived much longer than the doctors predicted, lending support to the request from Alfie’s parents for Alfie to be seen by medical experts in Italy. An air ambulance arrived outside the hospital where Alfie Evans is located. The parents are praying to get life support restored and to take him to Italy, which granted him citizenship. Italy’s Healthcare Chief has raised the alarm over the decisions by UK courts. The President of the Italian National Institute of Health decried the UK High Court’s decision on Alfie Evans. 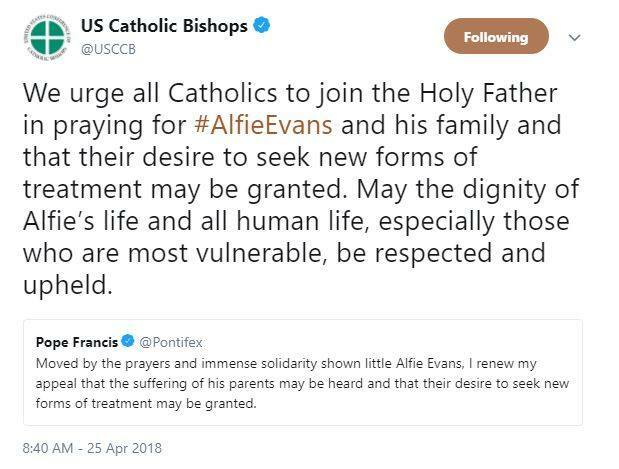 Pope Francis has reiterated his support for Alfie and his parents and asks that Alfie’s parents be allowed to bring him to Italy.